Part 4. Through Virginia to Arlington and D.C.
Good and Evil” several years ago. We had also wanted to return to Charleston, South Carolina ever since Betty had spent nearly a week at a culinary academy there a decade ago and I had joined her for a few days. new apartment in Arlington, Virginia in July 2005, our big driving trip though the heart of Dixie began to take shape. We spent a week in Amsterdam during Betty’s spring break from teaching culinary arts at a Memphis high school in March. We decided that another trip to Ireland would have to wait until the summer of 2006 when we could take advantage of our stockpile of frequent flyer miles. Plotting our route was pretty much decided by our planned stops. We wanted to stop in Atlanta to meet the parents of Casey’s girlfriend of two years, Caroline Cardon of Atlanta. JoAnn Cardon-Glass and her husband, Ron Glass, had suggested we get together for lunch or dinner while passing through. 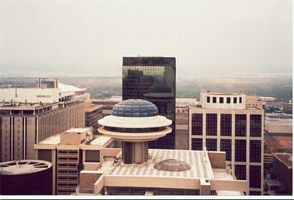 It made sense for us to drive from our home in Memphis to Atlanta, meet them for dinner at our hotel and head out the following morning. Betty and I spent most of our first year of marriage in Northern Virginia, where I was stationed at the Marine Corps base at Quantico (Viet Nam was cooking at full boil then). I was a corporal and editor of the base newspaper and Betty taught elementary school in nearby Stafford. Our love was rich but our money was scarce. We stretched our very modest income by spending most Saturdays in late 1968 and early 1969 at Virginia’s magnificent, Civil War battlefield parks or at the free museums in Washington, DC. We spent a great many enjoyable hours at such Civil War battle sites as Fredericksburg, Manassas (Bull Run to Northerners), Antietum, Chancellorsville and other locations where Confederate forces held the upper hand early in the war. Due to the driving distance from Quantico and expense of fueling our high performance Mustang, we had missed seeing the alpha and omega locations of the war. The alpha was Fort Sumter in the mouth of the harbor at Charleston, S. C.; where it all started April 12, 1861 when Confederate cannon fired on a Union Army garrison. The omega was where the beginning of the end came April 9, 1865, when General Robert E. Lee surrendered the Army of Northern Virginia to General Ulysses Grant. From Atlanta, Appomattox is an easy, half-day drive. Appomattox to Arlington is another half-day’s drive. There is lots to see and do in and around Appomattox so we allocated two nights for our stay there, followed by three nights for our stay with Casey and visits to various war memorials. It’s an all-day drive from Arlington to Charleston. The drive from Charleston to Savannah is less than a half-day, giving us lots of time to poke around the Historic District. We had first planned on making the drive from Savannah to Memphis in two days. But by pushing it and going way out of our way to stick to Interstate highways, we scooted across Georgia and Tennessee - making it home in 11 hours. was beyond brutal. We made the trip in Betty’s anniversary Mustang, a white convertible nicknamed “Sally,” but didn’t put the top down a single time. The driving conditions were close to ideal with good roads and generally light traffic due to our timing and the good luck of not having to pass through major highway repairs. Nonetheless, it was a long, tiring trip of nearly 2,489 miles that we’ll not soon repeat. Packed, planned and rested, we pulled out of our driveway in Mustang Sally on schedule at 8 a.m. We had dropped off our adopted Greyhound at the boarding kennel in West Memphis yesterday. We earlier made reservations through the Priceline service on the Internet for lodging in Atlanta; Lynchburg, Virginia; Charleston and Savannah. We have a small cooler of soft drinks, bottled water and sandwiches. Per the advice of our good friend Tim Parks, we will drive across Mississippi and much of Alabama on U.S. 78. His business has operations in both Atlanta and Memphis and he frequently drives back and forth, most often on U.S. 72 to I-65 in Birmingham and then on I-20 to Atlanta. Tim was worried that we might miss a turn or two in rural Alabama so suggested the U.S. 78 route. The highway was four lanes wide, generally smooth and with little traffic all across the width of North Mississippi. But the easy drive turned bad about 50 miles inside Alabama, where the divided highway became two lanes and sometimes three lanes wide. The road passed through numerous little towns and wide spots in the road, each with one or more sets of stop lights and slow speed limits. The drivers of big trucks, pickups and beat-up sedans were no more courteous on this day than we remember them being 40 or so years ago when we last drove this awful stretch of road to Birmingham. We ran into fairly heavy traffic and sections of bumpy pavement just outside of Birmingham and it stayed that way until we reached Atlanta. I do not understand why Alabama – unlike Mississippi – has put up with such sorry roadway connecting its most populous city of Birmingham with Memphis and other points to the west. Point of interest: There are no rest stops anywhere on eastbound U.S. 78 and I-20 between Memphis and Birmingham. The rest rooms at the Georgia Welcome Center near the Alabama line on I-20 were closed for repairs/renovations. Some welcome. We resolved to take a different route home on the way back even if it means going way out of our way. should have taken without all the bottlenecks. The hotel is ultra nice. Our room is on the 35th floor of the 45-story building. We have a great view of the downtown skyline from our window. Tired from the stressful drive, I took an hour-long nap so I wouldn’t be like a grouchy bear at dinner. We had a delightful meal and get-acquainted evening with JoAnn and Ron. We all agree that our adult children are perfectly matched. Casey and their beautiful daughter, Caroline, met at an Atlanta health club two summers ago. Casey, then an MBA student at Harvard, was doing an internship in Atlanta with a big real estate development company. 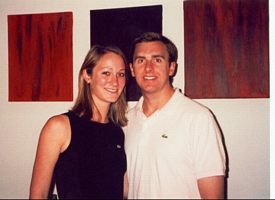 She was about to enter her fourth year in accounting at the University of Virginia, where Casey earlier earned his bachelor’s degree in civil engineering. They have been dating ever since, by long distance for more than a year and a half. The two now live less than a mile from one another in Arlington. Casey commutes to Fort Belvoir, where he is a development executive in charge of building more than 1,600 privately owned, housing units for the U.S. Army. Caroline, who passed all the CPA exams on her first try, is an auditor for a major accounting firm. We were awakened by a fierce thunderstorm pelting our window with heavy rain. There is a tropical storm gathering strength deep in the Caribbean that has us worried. Projections are that it will come ashore - with possible hurricane strength winds – on the Alabama/Florida Panhandle coast. Since it was just last month that our condo at Gulf Shores, Ala., was again habitable, Betty and I nervously watched the progress of Hurricane Dennis on the Weather Channel for the next week. The impact of Hurricane Ivan last September 16 was devastating to our property as well as that of thousands of others. The roof of our oceanfront condo building failed in the face of winds over 100 mph. A gap in the ceiling opened up and rainwater poured into our place, ruining the carpet, wallpaper and most of the furniture. It took 9 months to get the roof repaired, power restored and the interior/exterior of the building renovated. Many nearby buildings are far from complete. It’s that way all along the Gulf of Mexico coastline. The thought that another big blow could return us to square one is not a pleasant one.